We’ve worked hard to make Shion as robust as possible, but despite our best efforts, there are a circumstances where Shion will fail and give you a message like the one above. Perhaps you have an overeager puppy who pulled the USB cable from a PowerLinc, you received a faulty controller from the factory, or we did not find a hidden bug in our code. This recipe shows you how you can configure Shion to respond to these events by taking action to let you know what’s going on. Similar to the last recipe, we will be using Shion’s event features to catch hardware errors and let us know about the errors using e-mail. Step 1: Open the Events interface (using the Shion menubar item by your clock), and create a new event. Give the event a name (“Hardware Error”) and select Hardware Error as the event type. Step 2: Open Apple’s Script Editor application. This is typically located in the AppleScript folder in your Applications folder. Note that the ↩ characters indicate that the line continues. I have inserted them to make the source code more readable. Replace my@address.com with your own e-mail address. Step 4: Compile the script to verify that the code is correct. Run it once to verify that it is indeed sending out an e-mail. 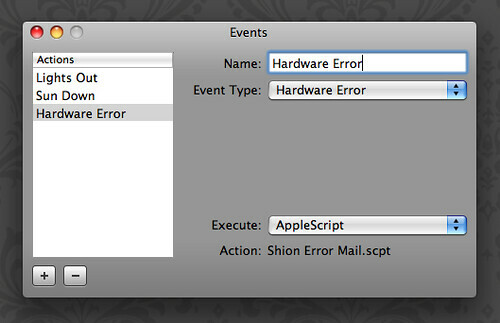 Step 5: Return to Shion and in the Events interface, select AppleScript as the action to execute. A file open panel will appear. Use this panel to locate the script that you just created. You can use this technique with other AppleScript-compatible applications to send yourself an IM, text message, or other notification using other channels. For the moment, I will leave these as exercises for the reader, but will be happy to describe them in more detail in future recipes.